I noticed a few of these signs appearing around Wangsa Maju (KL) at the end of last year. It would appear that the idiots who work for the vice syndicates have reached a new low with their standard of english. Following my previous article on the Market Hall I’ve been meaning to return for some time however up until recently certain events seemed to have conspired against me. When the restaurant opened there was a fair amount of buzz and although I no longer hear so many people talking about it, my previous review is one of the most popular pages on this site judging by the number of hits that it receives. Finally on the 2nd May we managed to return for dinner. Due to it being a public holiday the restaurant was pretty quiet and were promptly shown to our table. I had been looking forward to trying the lamb balti pie and several minutes after the order was taken the waiter returned to inform me that it had finished. To say that I was disappointed was an understatement and I fail to understand why sufficient pie’s can’t be made. After some deliberation the daily special was recommended which was basically a lamb stew in a tomato based sauce with a poached egg in the middle. My wife ordered the winter risotto and we had an appetiser of cheese filled spring rolls and side orders of herb roasted potatoes and steamed broccoli. The service was prompt and the issues highlighted in the previous review didn’t occur which is pleasing. Complementary bread with dips is served. A little while after ordering our food I noticed a blackboard containing fish dishes which we hadn’t seen due it being partly obscured by a light fitting. There is no mention of this is the menu , no prompting by the staff so I wonder how the majority of customers notice this. The starter was an interesting concoction of spring rolls filled with ricotta and gorgonzola cheese and for me it seemed to work well and certainly made a change from the more common style of spring role. Our main courses arrived together with the side orders which is a rare occurrence in restaurants in this part of the world and is something I prefer when eating western food. I have to say that I’ve never seen a lamb stew like this one. The sauce was very red and the egg in the middle was most unusual. So how did it taste? The sauce tasted like a bowl of tomato puree or perhaps a jar of pasta sauce and had a very strong tomato taste. This was overpowering and rather too strong with no real taste of any herbs or spices. The lamb was fairly tender and very lean but couldn’t really be tasted due to the over powering sauce. The egg seemed to go ok however I could imagine that some people maybe put off my this. The dish to me was a complete let-down and although I had no problem finishing it I would not order it again. I'm not a risotto fan so it would be a little unfair for me to fully judge this dish. To my wife and I it looked a little uninspiring and the taste was not quite what she was expecting. The vegetable side orders were simple and tasty and made a nice accompaniment to my bowl of tomato sauce (lamb stew). Although we like the setting we felt that the food was a let-down this time especially after the good food served the first time we visited. Perhaps we chose the wrong dishes but I’m not so sure. I will visit again at some point however with so many restaurants in the Klang Valley it may be a while before I’m back. A few years ago we seemed to be forever visiting Delicious for breakfast, lunch or tea with the Bangsar Village outlet being our preferred venue of choice. With so many places to eat in the Klang Valley and with places such as Delicious having a queue at peak times its easy to end up skipping a place for several months. Last weekend after a long absence we returned and had a rather mixed experience at the Bangsar Village outlet. I had no intention of blogging my visit but the experience left me so disappointed that I changed by mind. After being left standing at the front for a few minutes whilst ignored by several members of staff we were finally called through and shown to one of the small tables adjacent to the glass wall separating the outside smoking section. The issue of being ignored continued with the staff passing by our table completly oblivious to the fact that we would like to order our food and drinks. The strange thing about this was that we were sat near a small ordering station but the staff operating that area seemed completely spaced out and in their own little world. Finally I called somebody over to order the food and drinks. I ordered a lamb shank pie which was a mini lamb shank in a pie dish with a potato top plus a side dish of garlic potatoes and my wife ordered a classic Rueben. I’m rather partial to a lamb shank and this pie was pretty tasty. From previous visits I know that the garlic/herb fried potatoes are nice and the side order complimented the pie well. My apologies for no pics of the Ruben however the feedback was that it was pretty tasty. Whilst eating I finished my fruit juice but did anybody see fit to ask if we are ok or would we like another drink or even some iced water which some other customers had in a different section? Nope they just drifted around adjusting tables and continuing to be in their own little world. In many restaurants within this region I believe that they must have a shortage of plates because as soon as you finish your food you are likely to have your plate snatched by the staff. Delicious during this visit were no exception and bizarrely the space cadets (staff) took my empty plate whilst I’m still chewing the food and then after I picked up the last potato from the side dish they grabbed the bowl before I even had time to put the potato on my mouth. It was only when I saw my the expression on my wife’s face when I realised that it wasn’t a bad dream. After the meal I was still a little thirsty but the glass was still empty however the plate snatchers seemed oblivious to this. I decided to write a note on a napkin stating something along the lines of “I’m an empty watermelon juice glass and everybody ignores me. Please nice waiter will you refill me” and then placed the note at the top of the glass. Now to test whether the plate snatchers were really awake I moved the glass near the edge of the table and as if by magic the glass is snatched. No comment is made and before you can say one more drink please the glass had gone and was heading for the dishwasher. After a moment the staff returned to their station and we sat wondering what would happen next. Well the answer was absolutely nothing and nobody bothered to ask us if we wanted desert, water or even the bill and the staff just kept on passing by. Finally I stopped somebody and requested the bill and the formalities were promptly dealt with. The food was pretty good (as usual) but the service leaves a lot to be desired. I wish now that I started filming it and perhaps the next time that this kind of thing happens I will place it on YouTube for all to see. Jalan Telawi, 59100 Kuala Lumpur. After a long absence I recently made two flights to London within a few weeks of each other but on different airlines. Both of these flights were booked at short notice and I thought I’d share some comparisons. The first trip I took was on Singapore Airlines from KL-Singapore-London and the second was on Emirates from Singapore-Dubai-London. Both airlines use similar aircraft for the long haul sectors (A380 & B777-300ER) so it's easy to make a comparison between them. Singapore Airlines website is easy to use and no issues were encountered booking the flight from Kuala Lumpur to London via Singapore. Due to Singapore Airlines handing over the operation of many flights between KL And Singapore to its regional subsidiary our flight on the short sector was operated by Silk Air. Emirates has a number of flight options and careful attention need to be made to minimise transit time as well as avoiding the flight which stops in Colombo on its way to Dubai. I found the site a little clunky and the flight option I wanted didn’t seem to be offered unless I selected display by schedule as opposed to price. Once the booking is confirmed a copy of the conditions is emailed which is not the case with SQ. Singapore Airlines allow you to reserve a seat as well as select a seat when checking in on line which opens 48 hours before the flight. For flights operated by Silk air you can only reserve aisle or window however for check in you can select your required seat. On both the outbound and return flights the selection of available seats on the KL-Singapore sector were located at the rear of the aircraft and despite requesting a change at check in we were told that no other seats were available. On both flights seats located further forward were seen so I’m wondering its due to us being on a code share ticket. For the long haul sector the initial seats we wanted were not available so as soon as the check in opened I found that some suitable seats were available. Based on experience the cause of this is either a cancellation or more likely that there is only a limited number of pre reserved seats available. The check in staff in KL were pleasant and efficient however the staff at Heathrow seemed to have a bit of an attitude issue. Emirates have a simple to use online check in system and I checked in online 24 hrs before and printed out my boarding pass. When I went to drop my bags the home printed pass was examined and then two conventional passes were issued. I queried this and was informed that not every airport allows home printed passes. Whilst I like the idea of home check in, other than allowing seat selection it doesn’t seem provide any other tangible benefits when the bag drop takes a while to complete and conventional boarding passes are issued. Due to myself needing to make an itinerary change for the return sector and having to pay a small fee, online check in was not available. For some reason I was unable to also reserve a seat however upon contacting the call centre I was informed that the pre-allocated seats had all been used up however they there are some still available for Skywards members. The call centre staff were very good and signed me up to Skywards over the phone as well as reserving the required seats for me. Of all the airports in the world Singapore’s Changi Airport is probably the best and it’s transit facilities are extremely good. Terminals 1-3 are connected airside via an automated train with the journey time between them being just a few minutes. The last time I visited Dubai was in 2005 so I was looking forward to visiting the new Emirates terminal. The sector from Singapore was slightly delayed so by the time I was passed through the transit security check it was 50 minutes before the flight so I guessed that it was soon time to board. At Dubai the holding area was very full with a woefully inadequate number of seats to cater for the super large A380. As boarding time neared there appeared to be a delay and after a while the flight was re-timed although from where I was sitting I couldn’t see the screen or hear the announcement. Having rushed off one flight I was rather thirsty and decided to try and buy a drink. When attempting to leave the boarding gate, myself and several other passengers were stopped and told we couldn’t leave. One particular passenger questioned the supervisor and asked to speak to his manager and the situation started to turn ugly. In all my time flying I’ve never seen a more rude and aggressive member of airline staff and this particular man almost physically pushed the passenger back and then shouted at him to sit down. After several requests for water it took around 15 minutes for them to bring some which is extremely poor. With so many disgruntled passengers the staff simply locked the door so stop people trying to leave. I was also told that its only the economy passengers who were not allowed to leave. Whilst this is possibly an isolated incident the poor behaviour by the Emirates ground staff left me very disappointed. Emirates have boarding zone system rather than by row. This is quite a good idea but the implementation fails because the PA announcements are poor (was it B or D??) and the staff don’t check the boarding passes so a free for all occurs. The return sector from London to Dubai stopped at a remote gate so disembarkation was slow. Considering that the terminal in Dubai is new and empty air bridges were observed it’s rather poor that the steps and bus at to be used. Singapore Airlines split the economy cabin over the lower and rear of the upper deck on their A380 aircraft. Due to the curvature of the aircraft the upper deck is slight smaller and seems quieter. The seating is laid out 2-4-2 and most of the window seats have a small storage bin next to them under the window. The seats are slightly wider than Emirates and the leg room seems to be a touch better although the foot rest seems to get in the way. The Kris World entertainment system is very good however the Emirates offering outshines it by far. The food is generally good and menu cards are offered on both airlines. The only criticism I would have with the food is there are sometimes too many pork dishes offered. For example on one flight two of the three choices contained pork. Considering that Singapore is squeezed between Malaysia and Indonesia I’m surprised that SQ serve more than one pork based dish. The SQ crews are always good although sometimes they can be a little robotic and perhaps less personal. On both of my sectors the crew were very good with somebody doing a water/juice round every 30-45 mins for the passengers not sleeping. Due to the cramped nature of the economy cabin coupled with darkness sometimes aisle seat passengers get knocked by the crew but I find this to be minimal with the SQ crew. The flights from KL to Singapore were operated by Silk Air and due to it being a very short flight only a soft drink is served. The crew were pleasant and friendly and no issues were encountered. Emirates have demonstrated rapid growth over the past few years to become a major player especially in the London to Asia market. On my last flight with them in 2005 I wasn’t particularly impressed with the offering with the exception of the AVOD system which is known as ICE. Emirates and few other airlines have decided to fit 10 seats across in their 777’s compared to 9 in other airlines such as Singapore. The main effect of this is that the seats and narrower and although the actual space between the arm rests was ok I felt much closer to the person adjacent to me which wasn’t so pleasant. Another effect this high density layout has is to make the aisles extremely narrow which results in everybody knocking you and the clumsy cabin crew knocking you with their trolley on a regular basis. On the outward sectors I sat firstly on the flight side then after Dubai on the left side and encountered full on strikes to my kneecap which caused me to eventually scold the crew! I found most of crew generally rather clumsy and ungracious compared to the Singapore crew with frequent collisions between the trolley and aisle seat passengers as well as the crew also knocking into them seeming to be the norm and only cementing my opinion. The Emirates A380 is a little more spacious than their 777’s with the economy class section being located on the entire lower deck. An aspect of the crew which Emirates are proud of their diversity which has many as 8 or 9 different nationalities being present. Of the 4 sectors I travelled the crew varied from bad to ok. To elaborate a little more I found them rather inattentive, condescending and they didn’t seem to act as team when compared to other airlines. On my first sector approximately 1 hour from touchdown we were told to put the seats upright, tables stowed and window shades opened. When I questioned the cabin crew why this was so I received a rather curt reply that its better for everybody if the cabin is secured early - right!!! On most flights I’ve taken which are greater than 6 hours the cabin lights are usually dimmed after the meal to assist people trying to sleep. On the two sectors to London this didn’t happen and passengers were exposed to coloured lighting. The bright cabin also encouraged a lot of people to walk about which caused further disturbance for those trying to rest. The food was average and the portions seemed a little small but no real complaints here. On the return Dubai - Singapore flight we were offered a chicken tikka wrap as a snack and when I asked for an apple as well I was told that I'm only allowed one item however if there were any spares then I'll get one. The entertainment system was extremely good with a very comprehensive selection of music and films for viewing. One nice feature of the ICE system is the outside camera’s which allow you to watch the takeoff and landings from several locations. Perhaps my issue is that having been a regular over the past 10 years with both Malaysia and Singapore Airlines bench mark has been set high and Emirates crew currently don’t come anywhere near it. Most airlines don’t allow you to use your phone on board once the doors are closed. Emirates have a similar policy except upon landing as took as soon as you clear the runway an announcement is made that phones can now be used. The luggage allowances are 20kg for SQ and 30kg for Emirates. Whilst you can usually go a little over there is no way that SQ will allow 30kg so kudos to Emirates for their generous allowance. Only when you fly another airline do you sometimes appreciate how good Singapore Airlines are. If I have a choice and find a ticket for a reasonable price then I’ll fly SQ. Don’t get me wrong Emirates are not a bad airline however the points mentioned above and the fact that SQ has set the bar so high makes it difficult for others to match the product. I recently made several trips to London and as usual trying to find the balance between schedule, comfort and cost is always a challenge. Owing to myself being based in Singapore and my wife in KL we have a degree of flexibility over where we fly from. After checking the availability for flights to leave around 12 or 13 March we surprisingly found that Singapore Airlines ex KUL had a great fare RM3311 each. This was actually cheaper than the middle eastern airlines, a fraction cheaper than Air Asia X and significantly cheaper than Malaysia Airlines who wanted approx. RM5200. For my 1st trip I chose Singapore Airlines becuase of their fantastic product at that price it was a no brainer and for the 2nd trip I chose Emirates becuase of schedule and cost. Regular travellers will know that typically if you book a ticket that involves transiting through the airlines home hub then the tickets are usually much cheaper. In the case of Singapore Airlines it worked out to be SGD700-800 cheaper per person. Some examples based on tickets in May and June are displayed below. The examples for each airline are airline are in identical flights for the long haul sector eg both comparisons for the Malaysia Airlines are using MH4 and MH1 for the long haul flights. Having travelled on Emirates I couldn't possibly have left them out. A trend to note is that Emirates seem to be cheaper ex Singapore than KL. Perhaps this is due to the market at Changi being more competitive than at KLIA. A quick check of BA’s fares show their economy tickets cheaper than Emirates and the business class tickets around SGD 600 more. Many people can benefit from deals like this and for those that like to fly business class it can result in much cheaper fares although they are still a significant amount of money to pay especially if two people are travelling. Another point to note is that good competition tends to bring down prices hence the cheaper fares from Singapore. Today I was feeling rather hungry because I skipped dinner the night before so there is no better cure for morning hunger pangs than a trip your local mamak restaurant for breakfast. As I've mentioned in previous posts my local and favourite is Restaurant NZ in Wangsa Maju, KL so without a thought a headed there. 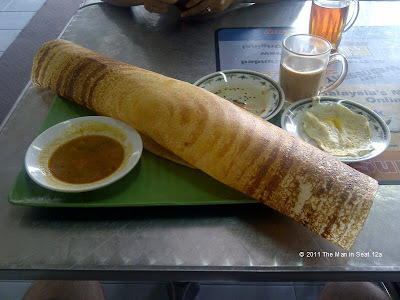 Today I thought I'd go for a paper thosai, with a side of a fried egg and a mug of hot teh tarik to wash it all down. I actually prefer the paper thoasi over a thoasi biasa due to its size and crispness and today I wasn't disappointed with my choice.